This pattern now has a matching hat called I can’t control my brain! 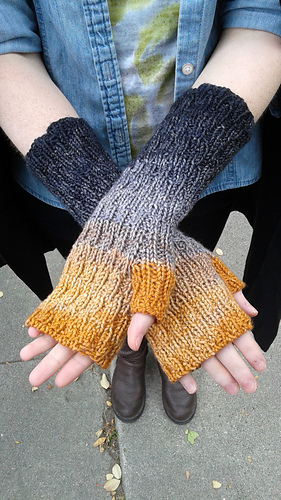 A texture pattern that is easy to work, fast, and fully reversible. What’s not to love? I call it the Wobble Rib. 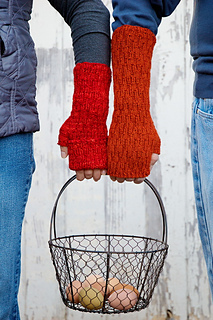 Made up of knits and purls with lifted bar increases for the thumb gusset, this is a pattern for advanced beginners. 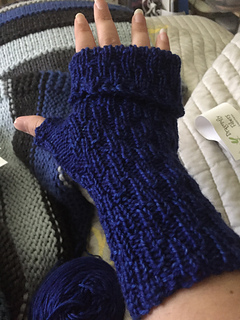 If you like long mitts you can make the gauntlet length version or choose to shorten the cuff down as far as you wish. 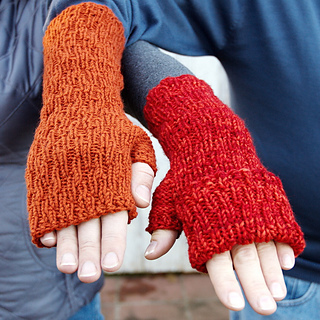 The pattern is flexible so you can also choose to make the fold-over finger cuff shown on the shorter red mitts to keep your fingers extra warm. 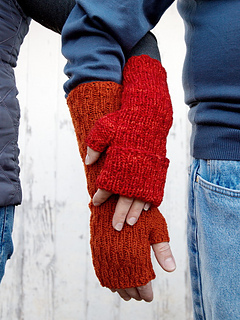 The sizes are to provide a fit with positive ease, allowing the Wobble Rib pattern to shine with it’s deep texture, but it is easy to add or subtract stitches at cast on to customize the fit of your mitts. 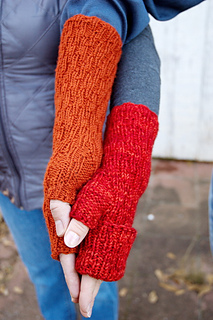 The gauntlet version is shown in Swan’s Island Organic Washable DK in color Pumpkin and takes two skeins of this yarn. 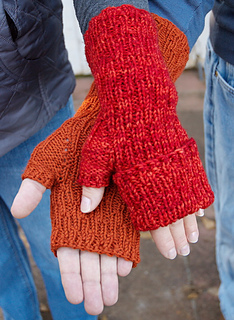 The fold-over finger version is in Squoosh Fiber Arts Ultra DK in color Blood Orange and took only one skein. 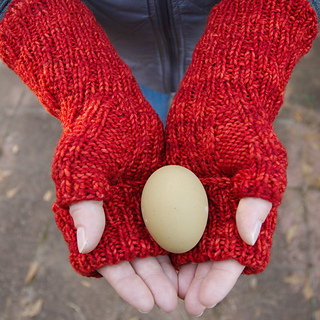 You can easily substitute your favorite DK or Sport weight yarn and if you check out the projects you will see that the pattern handles a fair amount of variegation quite nicely.